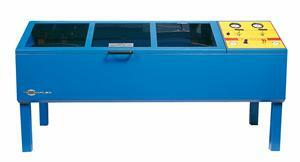 High Pressure Hose Test Bench designed to use water, eliminating the need for a special test fluid. Compact air driven power unit. Tough transparent Lexan bullet-proof cover. Capable of the static testing of hose assemblies at high pressures up to 22,000 psi. Hose capacity - 3/16" up to 2"